Inspirational Story! Gearhead Fights Cancer With His Show Car! The social media, besides being a great place to share new ideas or to show off our latest buys, is also a wonderful place to see some amazing people who share their life stories. Today we take you through a journey you will never forget! 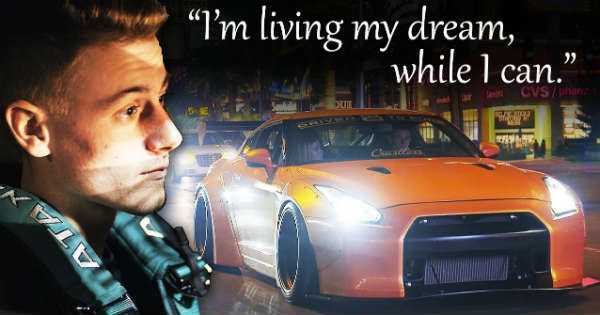 This inspirational story is about a young man who is fighting cancer with his amazing show car. The young gearhead had first found out about the disease when he was at the University of New Hampshire. He felt sudden and sharp stomach pains and he thought that it was the appendicitis, but when the doctors did a scan, he was diagnosed with an internal bleeding to the kidneys caused by a rare kidney cancer. This meant that he was immediately taken to Boston for a further research. He is currently going on a trial treatment which turned out to be helpful and constant. But he decided that it was time to seize the day and so he built a dream car which he uses it to raise awareness and funds for people who also have cancer. He had the stock Nissan version for couple of years, but then hooked up with some people and decided to re-build this monster. The car is able to produce as much as 700 HP. This awesome show car represents the non-profit organization named Driver to Cure which helps people with cancer. Go through the whole video and may this inspirational story guide your path towards a better life! For more inspirational people, follow this link!